Vasco da Gama was a Portuguese explorer during the Renaissance, in the Age of Exploration. Vasco da Gama was the first explorer to sail around the tip of Africa and reach India. Dias, another explorer, had rounded the cape, but his men wanted to turn back because they had already spent so much time at sea, so he never reached India. Vasco da Gama loved adventuring, and he didn't mind being out to sea for long periods of time. King John of Portugal appointed Vasco da Gama to try again to round the tip of Africa and head on to India. But it was under King Manuel of Portugal that the voyage was actually made in 1497-1499. King Manuel provided four specially designed ships for the trip, along with enough salted beef and wine to last for years! 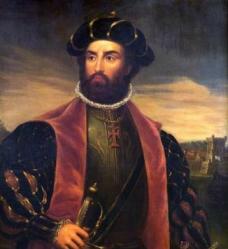 Vasco da Gama had planned on replacing vegetables and fresh water as needed, with quick stops along the coast of Africa. He brought a great many trinkets with him to trade with the natives. But he couldn't find many places along the rocky African coastline to safely land his boats, and when he could, the natives were not always friendly. Many men died of scurvy from lack of fruit and vegetables on the trip. But Vasco da Gama did reach India. He brought back jewels and spices. Vasco de Gama took one year to get from Portugal to India. Why?